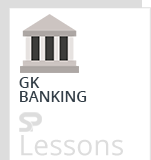 Banking Awareness Quiz 10 – Practice Sets article provides the list of several bank related questions to prepare aspirants of different competitive exams in India, primarily for banking related employment. The article Banking Awareness Quiz 10 – Practice Sets is very useful for different exams such as IBPS PO, Clerk, SSC CGL, SBI PO, NIACL Assistant, NICL AO, IBPS RRB, Railways, Civil Services etc. 1. Which of the following describes the term ‘legal tender? 2. What is the share of sponsor bank in the capital of RRB? 4. What is the base year for WPI (Whole Sale Price Index) ? 5. RBI increases Repo Rate to control which economic situation of economy ? 7. What is the objective of Kisan call center? 9. Which of the following rates is not determined by RBI ? 10. Which of the following were called the Presidency Bank ? (A) Bank of Bengal , Bank of Madras, Bank of India. 1. When was New Bank of India merged with Punjab National Bank ? 2. Which of the following deposits is not accepted by commercial banks ? 3. Which of the following in not the method of measuring National Income ? 4. What is the total No. of PSEs companies listed in Navratna status ? 5. Who is the chairman of Indian oil corporation Ltd ? 7. According to RBI Governor, which one of the following is a major challenge to its monetary policy ? 8. Which one of the following denomination of plastic notes is proposed to be introduced by RBI ? 9. Which of the following documents is/are generally sought for Housing loan approval ? 10. Whether loss-making banks can make donations? 1. The Basic Banking Services of a Bank include/includes _______. 2. Which of the following are not insured by the Deposit Insurance and Credit guarantee Corporation(DICGC)? 3. In which of the following sector/sectors FDI is not allowed in India, under the automatic route as well as the government route? 4. In addition to cash dispensing, the other services/facilities available at ATMs includes _____. 5. An EEFC (Exchange Earner’s Foreign Currency) account can be held only in the form of ____. 6. Reserve Bank of India relies on data submitted by Banks and quality of data is of great importance. In order to meet the need for correct and consistent data, RBI has initiated the project on ADF. What is the full form of ADF? 8. Where is located India’s first operational special economic zone (SEZ) ? 9. Who among the following are the beneficiaries of the “Reverse Mortgage Scheme”.? 10. Under which among the following acts, Hawala transactions are banned in India ? 2. Which among the following terms is commonly not associated with Budgets in India? 3. Which of the following is not helpful in controlling the money supply ? 4. Which of the following is a form of “Small Savings Bank” popular among the poor or children? 5. Which of the following statement(s) is/are not true about overdraft ? It occurs when the account balance reaches the level of minimum balance. (B) It is a form of credit extended by a creditor when the account balance reaches zero. (C) Overdrafts allow bank clients to withdraw money even when there are no funds in the account. 6. Which statement correctly describes ‘Bridge financing’ ? A. Finance provided to bridge the gap between poor and the rich. B. Bridge financing begins at the end of the first loan and ends with the start of the second loan. C. Bridge financing ends at the start of the first loan and starts with the end of the second loan. D. Finance provided to bridge the gap between Rural and the Urban people. E. Bridge financing is provided to fill the social gaps. 7. A very large loan extended by a group of small banks to a single borrower, especially corporate borrowers is known as _______. Which of these are the examples of liquid assets ? 10. Which of the following describes Hot Money? (A) Flow of funds (or capital) from one country to another in order to earn a short-term profit on interest rate differences and/or anticipated exchange rate shifts. (B) Speculative capital flows that move very quickly in and out of markets. (C) Capital that is responsible for stabilizing domestic money market. 1. When the exchange rate is adjusted so that an identical good in two different countries has the same price when expressed in the same currency. It is called______. 2. Prior approval (as also a licence) of RBI is required for opening_______. 6. Which of the following will replace the present tax structure like income tax, corporate tax etc from next year ? 7. What is the maximum amount of loan available to individuals on securities of demat shares? 8. Which one of the following monitors the liberalized remittance scheme, through which resident individuals may remit up to USD 200,000 per financial year for any permitted capital and current account transactions or a combination of both ? 9. What is the minimum period for which an NRE (Non Resident External) term deposit account can be opened? 10. Which of the following is not true about RTGS transaction? A. The minimum amount to be remitted through RTGS is Rs. 2 lakh. B. There is no ceiling for RTGS transactions. 2. A cheque which is issued today must be presented before at bank for payment within a stipulated period. After expiry of that period, no payment will be made and it is then called ———. 3. Which of the following is not true about NPA in banks ? B. It is created If a borrower misses paying his equated monthly installment (EMI) for 90 days. C. High NPA are a sign of good financial health. D. Asset Reconstruction Companies (ARC’s)buy bank NPA at a discount along with the right to recover the money. 4. What is the maximum population limit for a commercial bank branch to be declared as rural branch? 5. What does Current Ratio mean? 6. Interest spread is a commonly used term in banking. What does it describes ? A. The sum total of discount and interest from loans. B. aggregate deposits plus aggregate advances. C. total interest earned over total interest expended. D. total interest earned less the non-interest expenses. (A)The Kisan Credit Card (KCC) Scheme was introduced in August 2000. (B)Allied and non-farm activities are also covered under the Scheme. (C) Validity period of the KCC is 3 years. Which of the statements given above is/are true ? 9. Which of the following Private sector Banks has launched personal loan Swift? 10. The crop insurance scheme is being implemented at which among the following levels under the National Agricultural Insurance Scheme (NAIS)? 1. “Honours your Trust” is a Tag line of which bank? 2. Which among the following is / are the main objective(s) of National Green Crops ? A. Educate youngsters about environment and eco-systems. B. Prosecute and Punish the violators of Environment laws. 3. The Finance Ministry released the draft national public-private partnership (PPP) policy. Which of the following facts given below in this regard are NOT TRUE? (A) PPP is aimed at creating a framework for implementing infrastructure projects across sectors. (B) It addresses the issues concerning definition of various terms and also processes so that a clear and consistent position can be adopted by stake holders, including center, states and private investors. (C) The government is envisaging an investment of USD 7 trillion in infrastructure sector during the 12th Five-Year Plan (2012-17). 4. Which of the following organizations is created specially for providing credit to small and medium enterprises in India ? 5. What is full form of’NBFC’as used in financial sector ? 6. Which of the following terms is NOT used in the field of Banking / Finance ? 7. What does the letter V denotes in the term VAT as used in banking world? 8. Which of the following is called the World Bank? 9. We frequently read about ‘ MFI’ in newspapers. What is the full form of this term, which is used in financial sector? 1.’A customer is a person who maintains an account with a Bank’ This definition of the customer is as per _____________. 2. Which of the following cannot be endorsed ? 3. Which of the following conducts supervision over Commercial Banks, Financial Institutions, NBFCs and other Para – Banking financial institutions in India ? 8. The Tagline “Where every individual is committed” is associated with which of the following Banks ? 9. “Doha Development Round” is related with which of the following organization? 10. The rate at which Banks borrow money from the Reserve Bank is called ___________. 3. All commercial banks including branches of foreign banks functioning in India, local area banks and regional rural banks are insured by the DICGC. What is the full form of DICGC ? 4. Name a Poverty Eradication Programme in which banks played the dominant role? 5. Which pair is not correct ? D. FCI – Financial assistance to commercial institutions. 6. The minimum paid-up capital requirement at present for new Private Bank in India is ——-. 9. India Development Bond was issued in 1991-92 by ——–. 10. Which of the following is not helpful in controlling money supply? 2. Which of the following measures can check Inflation? 3. According to the Banking Regulation Act, nationalized bank can release a share of total paid up capital up to maximum ceiling of ——–. 5. Which one of the following is not a liability of commercial banks?